I was back in CA after a long roadtrip to Colorado, the Sierra Challenge starting the next day. Today was supposed to be a rest day, but that didn't preclude me from doing a few easy peaks. On my way north to Bridgeport in the early morning I stopped to climb Peak 8,592ft off US395, in the southwest corner of the Bodie Hills. From my parking spot alongside the road, the hike is exceedingly short, less than 2/3mi one-way. There is an old Jeep road going up to the summit from an old gravel pit. One can follow a side road just north of where I parked to the pit and then up the old road, or as I did, take the direct route through a short section of modest brush to the pit and then up the old road. It took all of 15min to cover the distance to the rounded top where a few BLM signs can be found indicating No Vehicles. There is a nice view of Dunderberg to the west, but otherwise the summit is remarkably unremarkable. Following this brief foray, I continued driving to Bridgeport where I took up temporary residence in the public library. I was eventually joined by my brother Jim and Sean O'Rourke who was the one to first introduce me to the best free WiFi portal in Bridgeport. After a few hours of doing the things that one does in the Internet Age, I asked if anyone was interested in an easy outing. Jim and Sean both readily agreed, apparently as bored of Internet stuff as I was. We piled into Jim's rental car and headed for the Hunewill Hills, a Sierra sub-range found at the south end of Bridgeport Valley, a drive of less than 10mi from town. We drove south on US395, exiting at the dirt Green Creek Rd and following a fork to Summer Meadows, then parking along the road between the Upper and Lower Summer Meadows. The summit was only a mile from where we parked but it would take us a full hour to reach it. Some of this was due to Jim's need to unpack the car crammed with gear for 10 days (including more than $100 of beer) so that he could find the few items he'd need for this hike. Most of the time, however, was taken up in fighting our way up surprisingly brushy slopes where I had expected to find a cake walk. The land ownership here is unclear - not USFS or BLM, there were no fences where we traveled, but there were occasional signs indicating a conservation easement boundary on the way up and a USFS boundary sign on the way down. The top featured some unpleasant brush that the others somehow found entirely my fault, the summit itself not easily located due to flatness and brush well over head level. 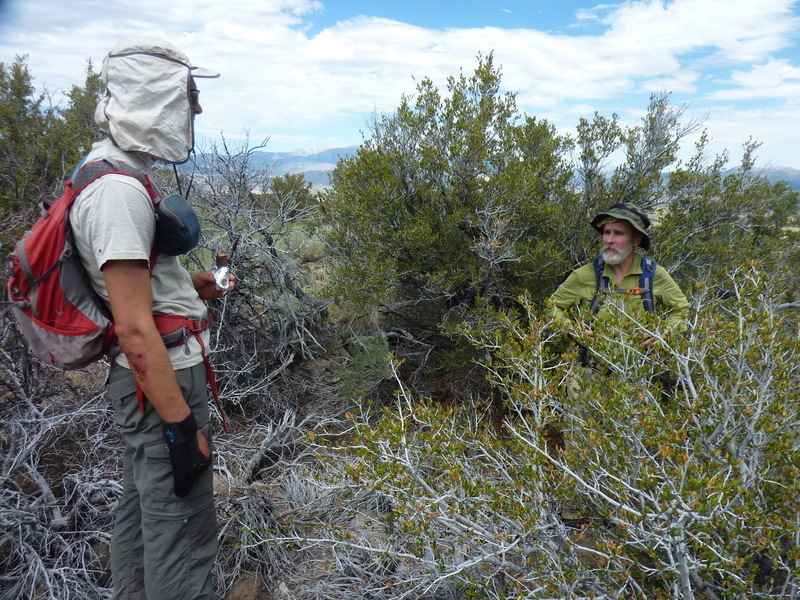 Jim found what seemed as good as any place to call the summit to which we readily conceded. We took a few photos looking east and west before heading down. We took a more direct descent down the steep southwest slope, a mix of sand and rock under forest cover that had little of the problematic brush we'd encountered on the way up. We landed upon the Summers Meadow Rd and walked the 3/4mi distance back to the car. Total time for this range highpoint - about 1.5hrs.